N.B. : I forgot my SD card and all photos in this post belong to Jasper of Six and Seven. Not much of a decor, the focus of Munch then is in its food: natural, fresh and (if possible) organic and freshly made right in the kitchen. 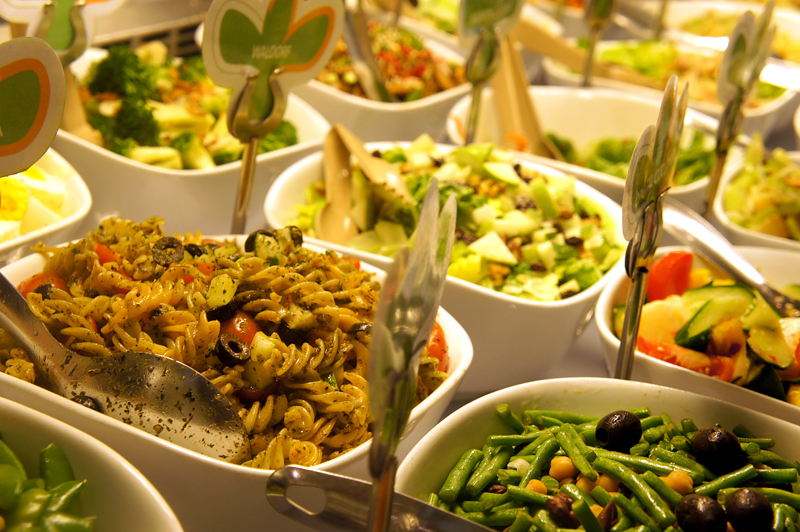 There are several combinations: you can pick 3 or 4 or 5 salads at $9.80, $11.80 and $13.80 respectively. If you’re picking pure vegetarian salads, deduct $1.10 from the sets. Add $4 to include soup and iced tea. Alternatively, you can order hot plate (a meat with two salads), ranging from $12 to $14.50. Given the location of the eatery, such pricing is relatively reasonable. You order at the counter, take a seat and the staff will deliver to you. I’ve never seen so many servers behind a counter before; the large number of servers ensure that you get your food fast. Freshly squeezed, no sugar added and you can choose up to five fruits/veg in the juices from $6.50 to $8.50, depending on the size. I picked mint, ginger and grape, which turned out to be a great mix. 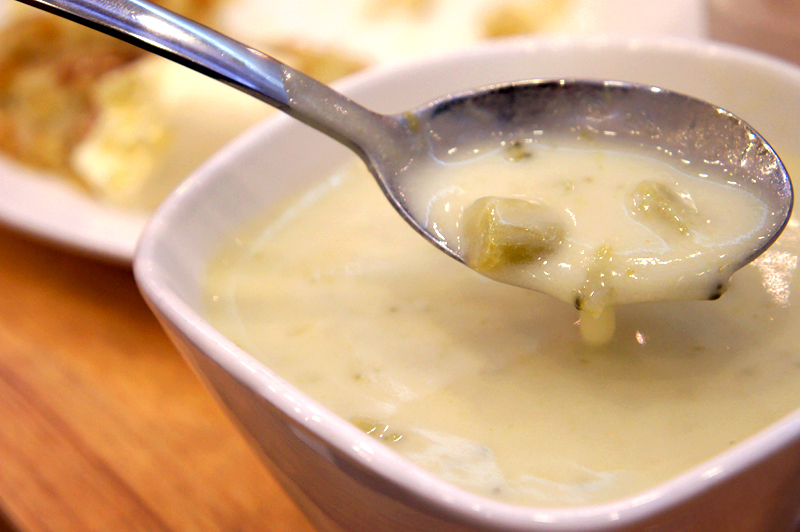 There are two soup-of-the-day-s to choose from and we picked Cream of Broccoli. It turned out to be rather watery but as we let it sit further, it got thicker and the flavors came out. Jasper, the soup expert, suspected that the base and the ingredients are cooked separately and the flavors only came out after we left it alone for a while. Not only a salad place, it serves wraps, sandwiches and breakfast food. 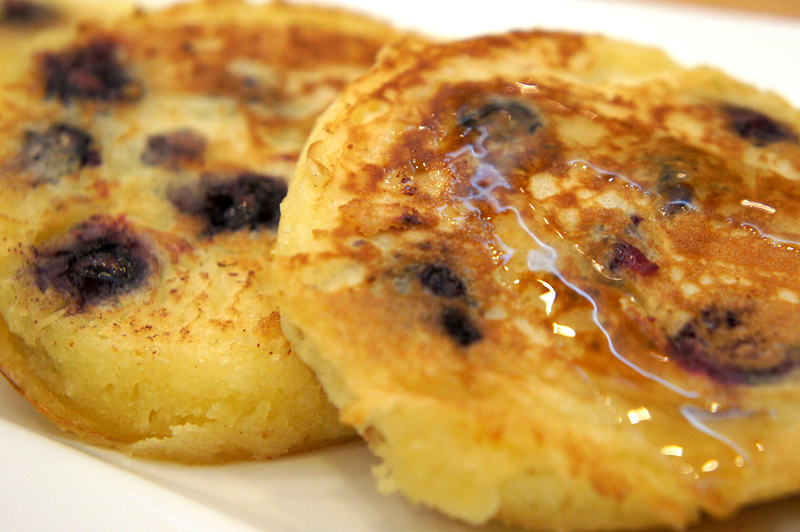 The blueberry pancakes ($6) are fluffy and use real blueberries. Quite a delight. 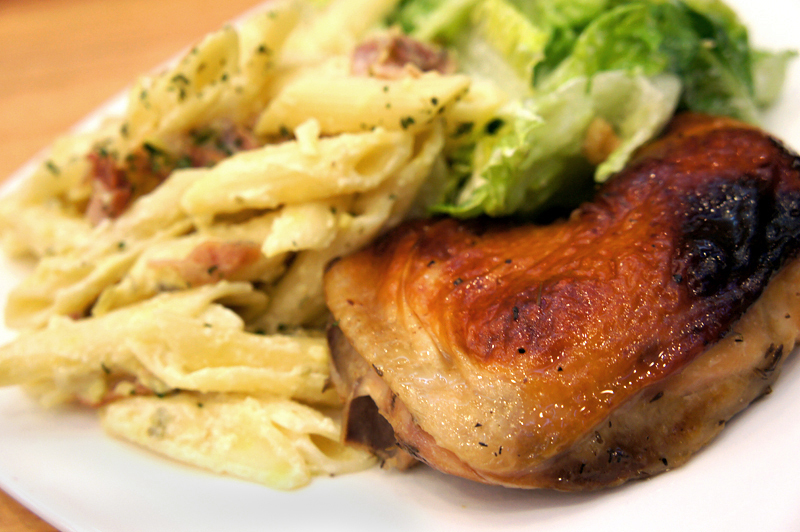 Roast Chicken + 2 salads ($12.50) is competitively priced and definitely value-for-money. The chicken is tender and moist. For the salads, we tried bacon & mash; chicken tikka; thai salad, chicken pasta (pictured above); vegetarian Waldorf (pictured above); chicken walnut (pictured below) and tuna nicoise (pictured below). Out of the seven salads, our least favorite, which surprisingly is the bestseller of the shop, is bacon & mash. The potato is dry and there isn’t enough mayo. The rest of the salads are satisfactory and I particularly like the chicken pasta (quite flavorful) and tuna nicoise that has grapes which give the salad a fruity sweetness. 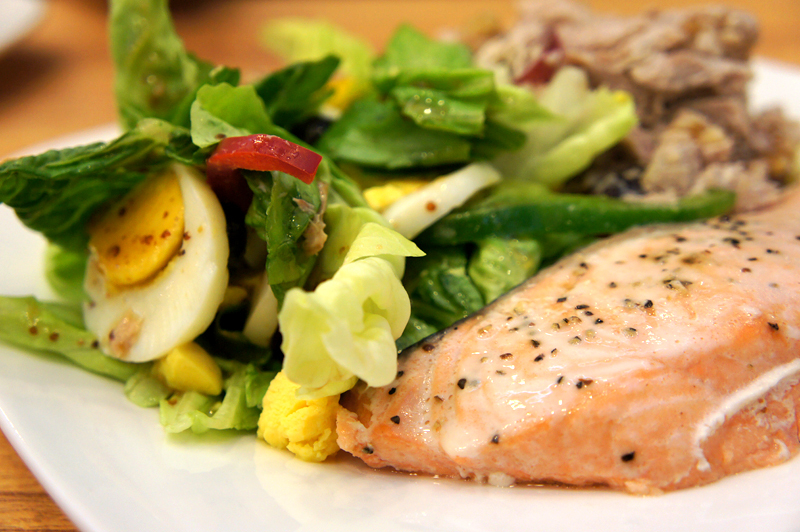 Salmon with 2 salads ($15.50). The salmon is quite a popular dish among the three of us. It is fresh and not over-cooked. 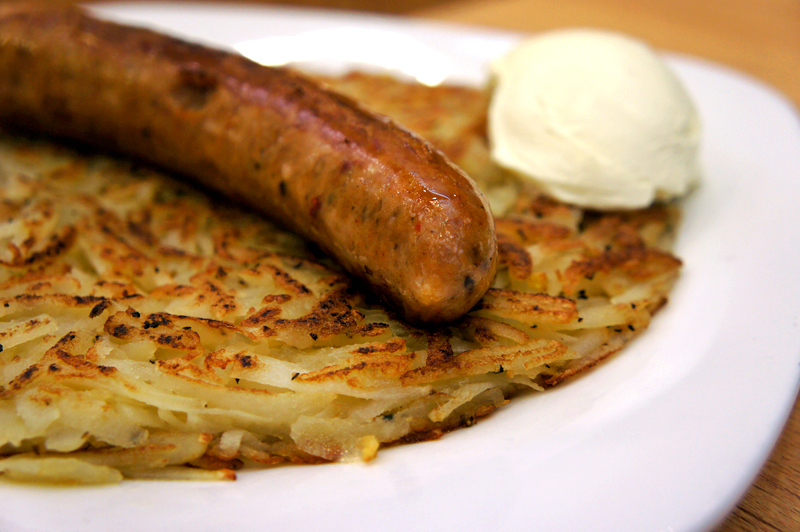 Rosti with sausage ($10) is anythingalsoeat’s favorite. If unremarkable, it is done well. While I wouldn’t travel all the way from Jurong to MBLM to eat at Munch, I’d definitely drop by if I am in the vicinity and up for a wholesome light lunch. The experience is pleasant and the food is satisfactory. There is also corporate catering for companies nearby. Facebook and JP Morgon are their customers! PS: We thank Edwin and the staff of Munch for the invited tasting and Jasper for the photos. facebook?!?! i must hang out there more often! i wanna work in fb! FB office is near tanjong pagar! you can hang out at Maxwell market.